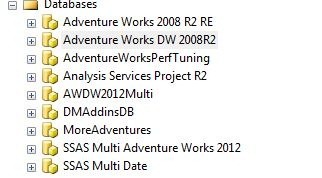 One property that has changed in the latest release of SSAS, now called BISM Multidimensional, is the Estimated Size of the cube database in Management Studio. This property no longer tells the whole story about the cube database size. Start Management Studio and connect to your SSAS service. Expand the databases folder and righ click –>properties on a cube database of your choice. 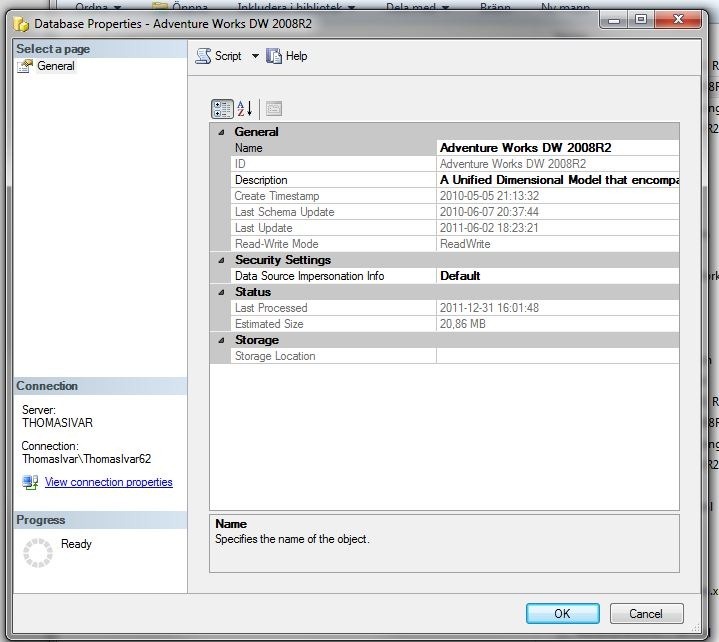 I will right click on the Adventure Works DW 2008R2 database and select properties. In the Estimated Size property above you can see 20.66 MB. This might look good since the source database file size is 141 MB. That implies a size down to around 14 percent of the original database size. The problem is that this estimate is not correct for the total cube database size like you can see in the next picture. The cube database resides in C:\Program Files\Microsoft SQL Server\MSAS10_50.MSSQLSERVER\OLAP\Data on my hard drive. There is one folder for each cube database. It is Swedish(storlek på disk = size on disk) and says that the cube database is 89.5 MB on my hard drive. The size is now 63 percent of the original database file size. This is actually the true story. 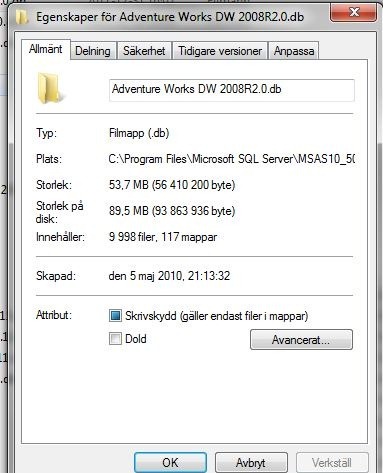 Be careful with the estimated file size in Management Studio in SQL Server 2012. Edit: Update(2012-11-11). After the kind assistance of Akshai Mirchandini, in the MS team I have got some clarifications that was not clear to me when I wrote the post. It is an estimate of the compressed total file size. This entry was posted on September 28, 2012 at 16:13	and is filed under No Category. You can follow any responses to this entry through the RSS 2.0 feed. You can leave a response, or trackback from your own site.